On December 15, 2015, the J. Paul Getty Museum in Los Angeles, California, unveiled its exhibit, Woven Gold: Tapestries of Louis XIV. The exhibition is displayed in three sections: Louis XIV as collector, heir, and patron of the arts. In 1662, the king founded the Gobelins (tapestries) Manufactory to decorate his residences and to aggrandize his public persona. 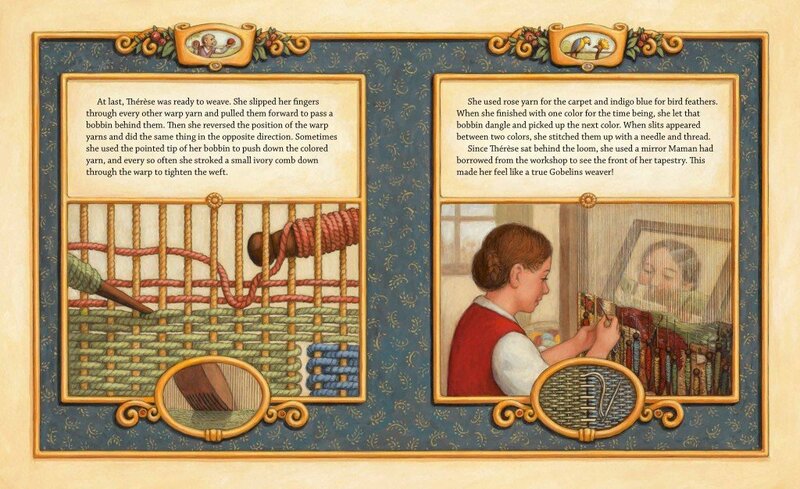 The Getty has released a companion book for young readers, Thérèse Makes a Tapestry written by Alexandra S.D. Hinrichs and illustrated by Renée Graef (Getty Publications, $19.95, Ages 6 and up). This historical fiction picture book is the story of a young girl and the real French tapestry (circa 1619-1690) Chȃteau of Monceaux / Month of December which is on display at the Getty Center. The book is set at the Gobelins Manufactory during the king’s 1643 to 1715 reign when many world-famous tapestries were woven. Thérèse, the main character of the story, wishes to weave, but females are not allowed to do this in seventeenth-century France. Thérèse’s father is a painter who travels with Louis XIV on his political campaigns because the king often features himself in the art he commissions. When Thérèse’s father returns home with one of his paintings, Thérèse is determined to make a tapestry of that image. As the story unfolds the reader becomes acquainted with Thérèse’s family and their neighborhood. Fascinating facts about the tapestry-making process are skillfully incorporated into the story line; readers learn about this craft as they follow Thérèse on her journey. Interior artwork from Thérèse Makes a Tapestry by S. D. Hinrichs with illustrations by Renée Graef, Getty Publications ©2016. This debut picture book for writer Alexandra S. D. Hinrichs uses language which a six-year-old (who is being read to) can understand, but has the depth to engage a teen reader. Realistic illustrations are masterfully painted by award-winning illustrator, Renée Graef. The historically accurate images are colorfully appealing for younger readers yet mature in detail and subject matter. Another pleasing aspect of Thérèse Makes a Tapestry is that a reader may enjoy the story, then see the actual tapestry featured in the book. The thirteen tapestries in the exhibit are stunningly large—it would take four weavers about four years to complete one of these tapestries—and in a meticulous state of preservation. Hung at eye level, the gleaming threads of real gold and silver sparkle invitingly. Reading the book in conjunction with visiting the exhibit gives an understanding of Paris during the seventeenth century and the artists who crafted these masterpieces. The weaver faced the back of the tapestry, using a mirror to view a reflection of the cartoon (a drawing or painting of the design) and to watch the image develop. During the time of King Louis XIV, weavers worked together, utilizing their areas of specialization, such as human faces or animals. Most tapestries on display at the exhibit are composed of wool, silk, and gilt metal- or silver-wrapped thread. Since the materials used faded at different speeds, the tapestry makers decided how to dye the thread both for immediate viewing and for a predicted harmonious collaboration of colors. Understanding the time and expertise devoted to each design imparts a deeper appreciation of the tapestries which have survived the centuries. King Louis XIV’s contributions to this art form were immense. An inventory taken in 1666 noted 44 suites (or groups) of tapestries. At the time of his death, there were 304 suites with approximately 2,650 tapestries in the collection. In addition to commissioning new work, King Louis XIV actively purchased antique tapestries. Of all these tapestries, only an estimated 600 still exist. Many degraded over the years and were consciously destroyed. Others were lost during or after the French Revolution; some were burned to extract the gold and silver bullion within. Remarkably, the Gobelins Manufactory is still functioning and the tapestry-weaving tradition carries on today. One difference is that the weavers now are all women and one weaver typically completes the entire tapestry—this would surely please Thérèse! Marking the 300th anniversary of the death of King Louis XIV, Woven Gold: Tapestries of Louis XIV is the first major showing of tapestries in the Western US in four decades. An interesting conclusion to the exhibit is a modern piece (2001–2004) made of wool and linen by Raymond Hains. 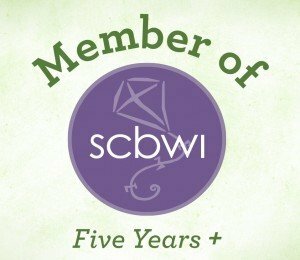 Related events such as talks, courses, and a symposium begin January 5, 2016. Thérèse Makes a Tapestry and the exhibit are ideal companions for one another, though either can be enjoyed alone. The book is exclusively available through the Getty until its release for sale to the general public on March 8, 2016; the tapestries exhibit runs through May 1, 2016. This is an opportunity for families to spend time together then bring home a keepsake. The exhibit and the book acquaint us with this enduring craft which may seem anachronistic with our instant-gratification world. By viewing these tapestries and enjoying the accompanying book, perhaps our children will build an appreciation for the humanity and soul instilled in these masterpieces which have gracefully withstood the passage of time. The Getty Center, 1200 Getty Center Drive, Los Angeles, CA 90049. Closed Mondays. To purchase book, please click here. 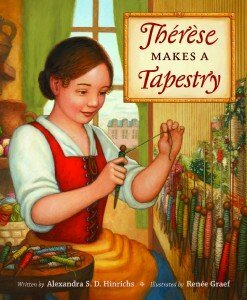 ENTER OUR GIVEAWAY: Win one (1) copy of Thérèse Makes a Tapestry. Plus, if you follow us on Facebook and let us know in the comments below, we’ll give you an extra entry. Follow us on Instagram and get an additional entry, too. Good luck! What a wonderful book and review! I love the detail in the illustrations. The border detail, I told Graef, reminds me of Jan Brett yet is uniquely Graef. 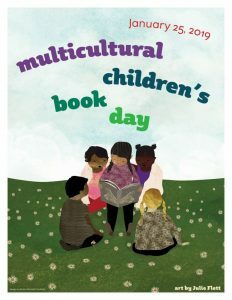 I agree with Christine that the subject matter and story are suitable for a broad age range making this book a valuable resource for libraries and schools, too. Absolutely lovely! I hope this exhibit will travel to the East Coast. If not, I will content myself with this beautiful book. Good question, Cathy, as it is travel worthy, but I never found out if the show was an exclusive or not. The book is fascinating and both Hinrichs and Graef have done SO much research for historical accuracy. This looks like a beautiful book that will stand the test of time, as does it’s tapestry subject. It really is an eye-opening and engaging read. And so true re: its timelessness. I learned so much about tapestry making and can now appreciate these works of art so much more than before reading the book. This looks like a fantastic book — I look forward to reading it! I am certain you will enjoy it. Would love to hear back after you’ve read it. Ah, the first Venice mention. I cannot begin to imagine how splendid it must have been to live there although 17th century Venice was a war-filled time. But one of my favorite artists, Canaletto, was born towards the end of that century. I would like to live in the carribean because i hate cold weather. Would you have been a pirate, Mike? Considering my aversion to cold, the Caribbean is a great option. If I could live in the 17th century – I would love to live in Vienna. I love it now — and would have loved to live there back then. I can just imagine how beautiful it was, but when I last visited it was FREEZING. Hard to imagine staying warm in 17th century life. I would love to live in England in the 17th century. Such beautiful architecture and such. Of course, I would want to be royalty lol. Yes, being royalty rocked, didn’t it? Although there certainly was a lot of treachery, too. I do agree about the architecture. Compared to the average French citizen, Thérèse in Thérèse Makes a Tapestry lived a very good life. Two cities I have lived in and loved! Now you’ve got me curious about 17th century Florida, Angelica. Thanks for your comment. I would live in Italy,for the art,food,culture and music,so romantic! I follow on Facebook and Instagram. I’m a big Italy fan, too, Lisa. Good choice, and good luck!! I am so excited to learn about this book. It combines everything that I love: great research and writing plus wonderful illustrations, plus it is also tied in to a wonderful exhibition. It is so engagingly written and richly illustrated. A true gem. Thanks for your enthusiasm, Annina. Thanks for stopping by, Laura. Good luck. I would want to live in Ireland. Have only been to Dublin, but so want to visit. Sure wonder what 17th century Ireland was like. I would love to live in Ireland. This is a beautiful book! Yes, Cindy, Thérèse Makes a Tapestry by Alexandra S. D. Hinrichs with art by Renée Graef is absolutely a feast for the eyes. I like to live in the imperial court in China or Japan. Wow, Beth, you are the first person to mention Asia and I agree that the imperial court sounds intriguing. I would pick anywhere in Ireland! Jennifer, Ireland seems to be up there in popularity. Good luck! I would want to live in England. England is always a good choice, Katherine!